Israel boycotter flies EL AL! You probably won’t have noticed, there’s been no press, but this week a small boat with nine Jews left Cyprus to try to break the “siege of Gaza”. Why anyone would risk their lives doing this after what happened on the Mavi Marmara is beyond me, especially after Israel recently agreed to lift restrictions on goods entering the Gaza Strip. The Irene‘s cargo included what was termed “symbolic aid” and included toys, musical instruments, textbooks, fishing nets and prosthetic limbs. Richard Kuper, of Jews for Justice for Palestinians, said that the Jewish Boat to Gaza is a symbolic act of protest against the Israeli occupation of the Palestinian territories and the siege of Gaza. Here is all the information, and more, you need to know about the Jewish boat to Gaza. 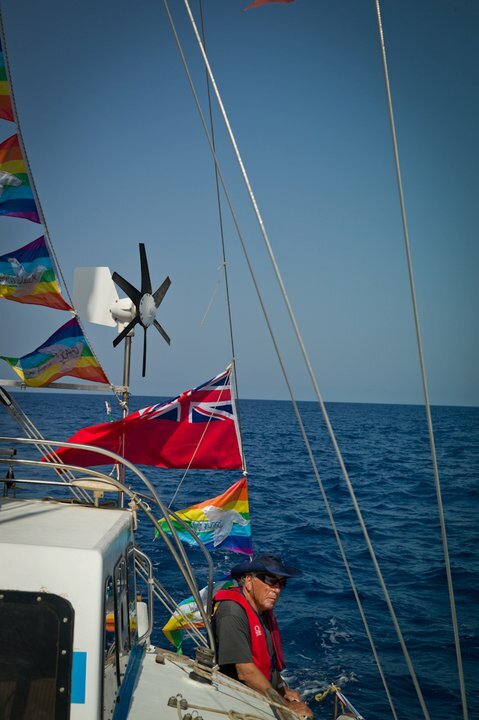 The “Jewish boat” left Cyprus at 13.32 local time on sunday. On tuesday the boat was boarded by the Israeli navy and taken to Ashdod port. He then called on worldwide support for the boat. By wednesday, Glyn Secker, Irene’s captain, was on his way back on EL AL flight LY315 and arrived at 13.35 at Heathrow airport. 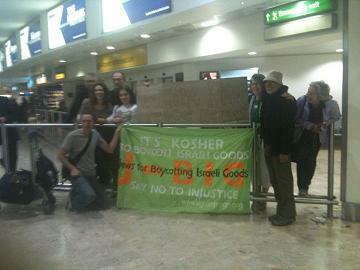 At Heathrow the “worldwide support” that showed up to greet Mr Secker consisted of eight people from Jews for Boycotting Israeli Goods (JBIG). Heathrow: Mr Secker's welcome home party (Jewish Chronicle). And making him fly EL AL? Someone in the Israeli authorities has a sense of humour. Surely, they could have saved Mr Secker some face and put him on a British Airways or an Easyjet flight. I can imagine his clenched fists on the flight home. But then again it may have allowed Mr Secker to reconnect with his Jewishness in a more positive way. When the kosher meal came did he choose chicken or beef? There is no problem with Jews not expressing any form of Jewishness or with them protesting Israeli policy. But the average Jewish anti-Israel activist only seems to employ his or her Jewishness destructively; by tearing down Israel in toto. There are a plethora of anti-Israel organisations that all use the prefix “Jews” or “Jewish”. Surely, in the fight for peace and jusice one’s religion is irrelevant. We all want peace and justice whether Jew, Christian, Muslim, Hindu, atheist etc. 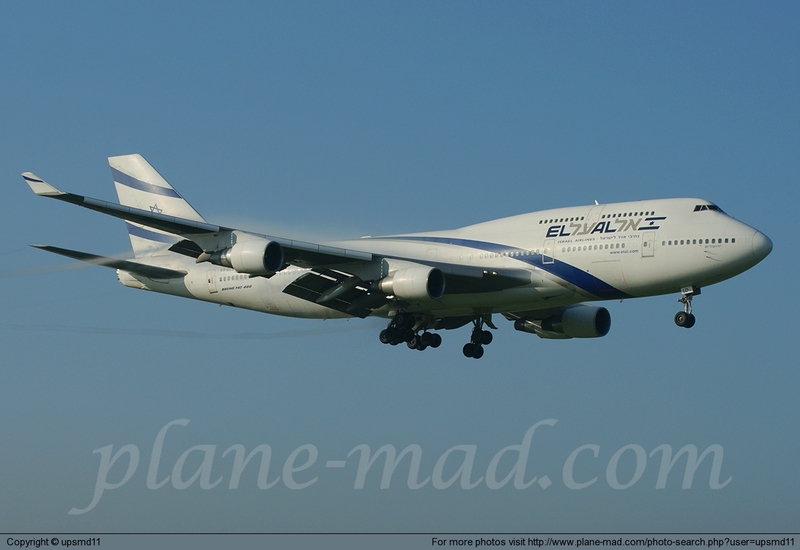 Anyway, I hope that EL AL gave Mr. Secker bonus air miles so he can fly them again soon. Miliband E.: A disaster for Britain, a disaster for Israel. 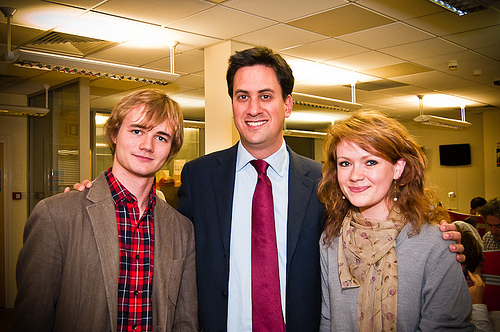 New Labour leader, Ed Miliband (middle). Ed Miliband’s (EM) election as leader of the Labour party while in opposition to the Conservative-Lib. Dem. coalition is a disaster on many fronts. It wasn’t meant to be like this. His warmer, more charismatic brother, David (DM), was supposed to win. The coalition is loving the result. It will be easy to paint the new leader as Red Ed and as in thrall to the unions who, in effect, made him leader. EM does not have the support of either the majority of ordinary Labour members or of Labour MEPs and MPs under the arcane tripartite electoral system that Labour uses. It was the three main trade unions; GMB, Unite and Unison, that won it for EM. Although it was a free vote the leaders of these three huge unions publicly backed EM and that was enough. The trade unions favour the working class but their problem is that they would rather the country got poorer as long as everyone was more equal. They give no credence to capitalism whatsoever. A form of communism-lite is still their preferred way forward. Being in government is not of great importance as long as they can go on strike and bring the country to its knees. Margaret Thatcher recognised the damage they can do. She smashed them but they are back with a vengeance. Labour is also in financial trouble and multi-millionaire backers like Lord Sainsbury and Lord Alli could be set to lower their donations leaving Labour looking for even more support from the unions. Labour has emasculated itself by voting for EM giving the governing coalition five years of an open goal with which to do as it pleases unchallenged. This is not good for us. We will have to put up with five years of uncompetitive politics. DM’s campaign must have suffered from complacency. But he showed his sharpness, warmth and humour yesterday when trying to evade a media scrum. “Please ladies and gentleman, I am leaving,” he complained to which a reporter asked “Are you really leaving, Mr Miliband?”. DM turned around with the broadest of grins and replied: “I’m leaving the building”. If DM does leave British politics for another job he will be missed. His brother is dull and uncharismatic by comparison. More than that his brother has been an MP for just five years to DM’s nine and his only major brief was as Climate Change secretary. In contrast DM was Foreign Secretary and has striven the world stage gaining respect and experience. I doubt few overseas politicians would know EM. And being in thrall to the unions does not bode well for Israel either. We know that many unions are ignorant of the true complexity of the Israeli-Palestinians conflict but their knee-jerk reaction is to be anti-Israel. Recently they voted to continue a boycott of Israeli settlement goods at the TUC conference. This demonisation of the settlements and the settlers (both of which are perfectly legal) doesn’t help anyone. It entrenches the Palestinian position and leads to more dead settlers as we saw recently with the killing of four innocent Israelis near Hebron. But thank goodness for small mercies as a full boycott of Israel was expected. Next year maybe. In addition to communism-lite at home the Israeli-Palestinian conflict also gives the trade unions the chance to play Trotsky/Lenin abroad. Due to increasing cooperation with the Palestine Soldiarity Campaign a one state solution, where the Jewish state would disappear, is becoming the default position of many union members. It is hard to see EM opposing any of this knee-jerk trade union anti-Israelism whereas DM, being a Blairite, would have been more open to persuasion and more independent. None of this takes into account the background of the Milibands, whose late father, Ralph, was a Marxist academic and whose mother Marion Kozak is a leading member of the anti-Israel Jews for Justice for Palestinians (anti-Israel in the sense that they prefer that one-state solution). With David “Gaza is a prison camp” Cameron, William “Israel acted dispoportionately” Hague and Nick “Ban arms sales to Israel” Clegg in the three most important positions of PM, Foreign Secretary and Deputy PM respectively and Ed Miliband as opposition leader and David Miliband, currently as shadow Foreign Secretary, things don’t bode well over the next five years for Israel. It was DM who, while Foreign Secretary, took the decision to expel an Israeli diplomat from Britain over the assassination of a self-confessed Hamas terrorist in Dubai, without the allegation being proved, but he seems to be far more preferable to his brother for both Britain and Israel. EM could surprise us and prove to that he isn’t in hock to the unions. We need a strong opposition. I hope to be proved wrong, but I am not hopeful. And I hate to criticise a Leeds United supporter. Middle East Monitor (MEMO) is one of those nasty anti-Israel think-tanks which aims to win the ear of the political establishment. Fair and accurate? Pull the other one. They won’t even let you into one of their meetings if they disagree with your views. Now MEMO asks: Is Britain’s new ambassador to Israel really going to be objective? Should being Jewish really disqualify them from all aspects of political life involving Middle Eastern matters? And yet I wish I had a pound for the amount of times that someone’s Jewish background has been utilised to make a political point when it is to Israel’s detriment. Richard Goldstone, who in his shabbily investigated report into Operation Cast Lead found Israel guilty of war crimes, has repeatedly had his objectivity placed beyond reproach solely because he is Jewish. Then people who call for boycotts against Israel and march through London holding Hezbollah and Hamas flags think themselves beyond reproach with regards to anti-Semitism because they have a few communist Jews and the extreme religious Jewish sect of the Neturei Karta marching alongside them. And now MEMO highlights the new British Ambassador to Israel’s Judaism as being a possible hindrance to his objectivity and raises the age-old issue of Jewish loyalty to the country in which they are citizens. Despite Matthew Gould’s claim to be “a career diplomat”, his previous service as the principal private secretary to Labour’s David Miliband (also a member of North London’s increasingly influential Jewish community) when he was Foreign Secretary suggests that Conservative Mr. Cameron is indeed playing the Jewish card with this appointment. But for whose benefit: Britain’s or Israel’s? This despite Cameron recently calling Gaza a “prison camp”! But politicising the deaths of six million Jews in this way does “diminish the significance of the Holocaust”! This is all despite Matthew Gould being a model British citizen, serving Britain to the best of his abilities and paying his share of taxes to support Britain’s needs. Now the only apparent problem is that he’s Jewish. And because he is Jewish MEMO perniciously describes Gould as “in all but name, a person with dual citizenship rights”. In employing someone’s religious background so gratuitously in order to try to smear that person ignorant organisations like MEMO display that, for some, Lilienblum’s thesis is still intact today, 127 years later. (For more commentary see here and here). There are not many times that you can say that anti-Israel activists are outsung and outnumbered, but yesterday they were. 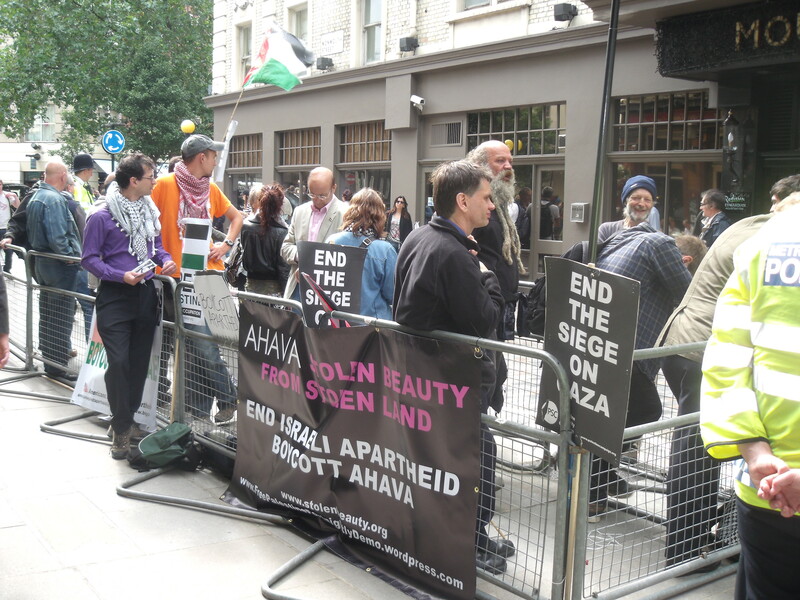 The usual mob of nothing-better-to-dos turned up outside Ahava in London’s Covent Garden to vent their hatred for the Jewish state. Only one person brought along an Israeli flag. She said she came as she was worried that as it was Jewish New Year there would be no one around to stick up for Israel. Apart from her and a few others the pro-Israel pen was looking pretty sparse. Then as the small pro-Israeli contingent were deciding where to break for lunch twelve Israeli tourists who had seen the protests outside Ahava came into the shop and then marched out again, filled the pen and sang Am Israel Chai, David Melech Yisrael, Hatikva and Hava Nagila (see first two clips below). The anti-Israel mob became less interested in handing out their leaflets and more interesting in demonising the Israeli tourists, with some directing shouts of “racist scum” towards them (see beginning of third clip below). The next lets-all-demonise-Israel (and anyone who supports it) event will be at midday outside Ahava on 25th September from midday. Yom Kippur 1973 – Egypt attacks Israel. Saturday (Shabbat) 8th May 2008 – Thousands of people marched through the streets of London calling for an end to the siege on Gaza, the right of return for Palestinians and an end to Israel’s occupation. 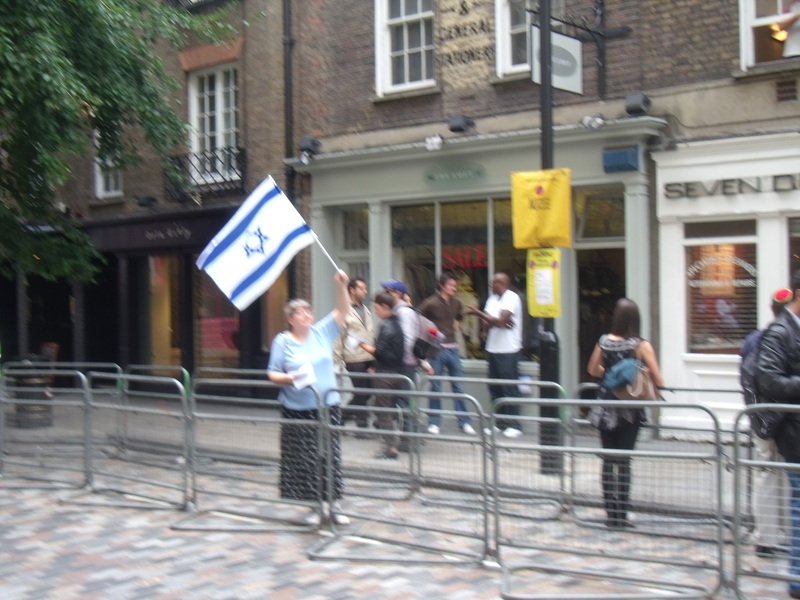 Every other Saturday 2009/2010 – The now infamous demonstrations outside the Jewish Israeli owned Ahava shop in London’s Covent Garden. Saturday (Shabbat and Yom Kippur) 18th September 2010 – A new overland convoy, Viva Palestina 5 – a global lifeline to Gaza, is leaving for Gaza from London. So, Al Quds Day, brought to you by the Iranian regime that wants to show “solidarity with the oppressed of the world” and “eradicate injustice around the world” while executing thousands of its own citizens every year for such “crimes” as committing adultery (women only though), being gay and, of course, disagreeing with the general policies of the Ahmadinejad/Khamenei regime. As ever Hezbollah and Hamas flags will be paraded in London along with the now ubiquitous “We are all Hezbollah” and “We are all Hamas” banners and this just a few days after four innocent people, including a pregnant woman, were slaughtered by Hamas near Hebron. The public statements of Sheikh Nasrallah, the leader of Hezbollah, are well known. Jews are descended from pigs and apes being one while another is if Jews all gathered in Israel it would save the problem of going after them worldwide. And so go after them worldwide they did. In 1992 Hezbollah blew up the Israeli Embassy in Buenos Aires killing 29 people. And in 1994 Hezbollah blew up the Jewish community centre contained in the AMIA building in the same city killing another 85 people. Argentina has warrants out for the arrest of the suspects who are all now fully protected in Iran, which instigated both attacks. So while tomorrow’s Al Quds day march is taking place Londoners should hold their noses tight as the stench of hypocrisy reeks across the capital. Meanwhile, it would be nice if anti-Israel demonstrations could sometimes take place on a Sunday so Britain’s 280,000 Jews could at least come out en masse for once to tell the protesters what they think of them. 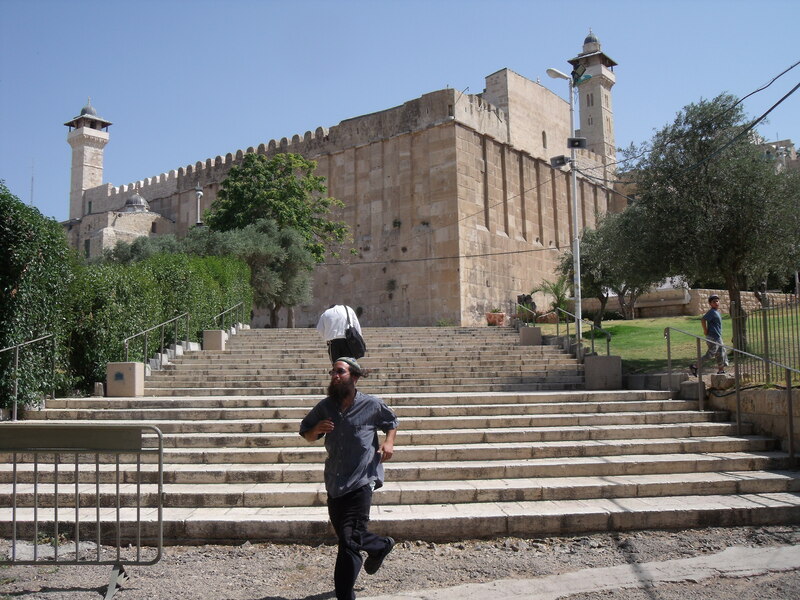 The main trouble with Hebron on the West Bank is that it is one of the holiest sites for the Jewish people. 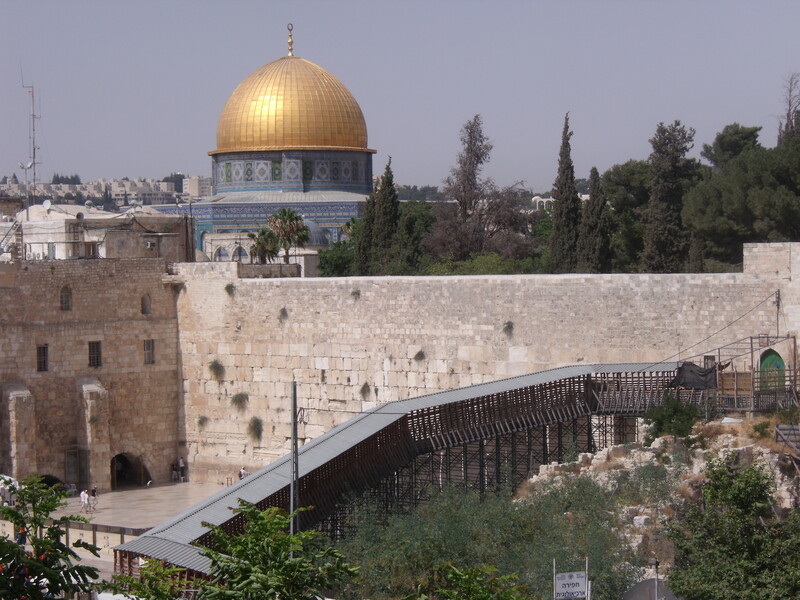 It is second only to the Temple Mount and the Western Wall in Jerusalem. 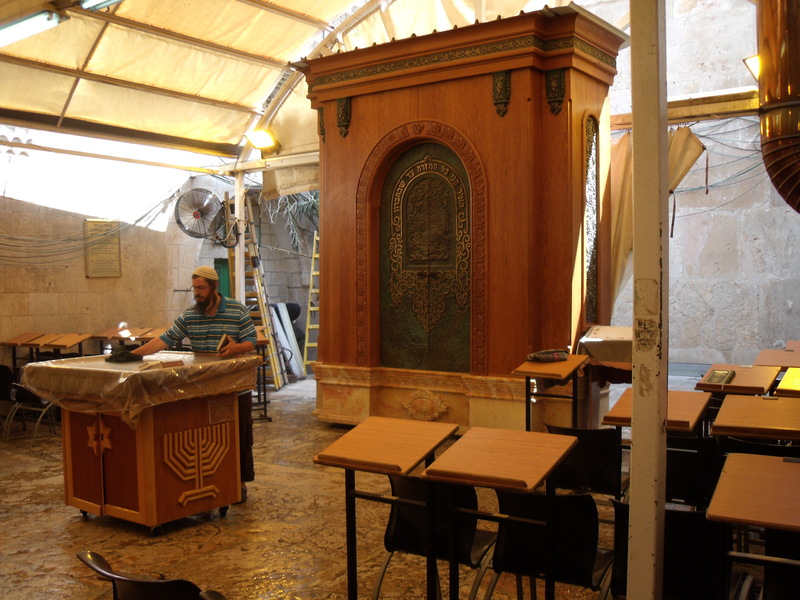 In Hebron sits the Machpelah, which is said to have been purchased by Abraham, the progenitor of the Jewish people. 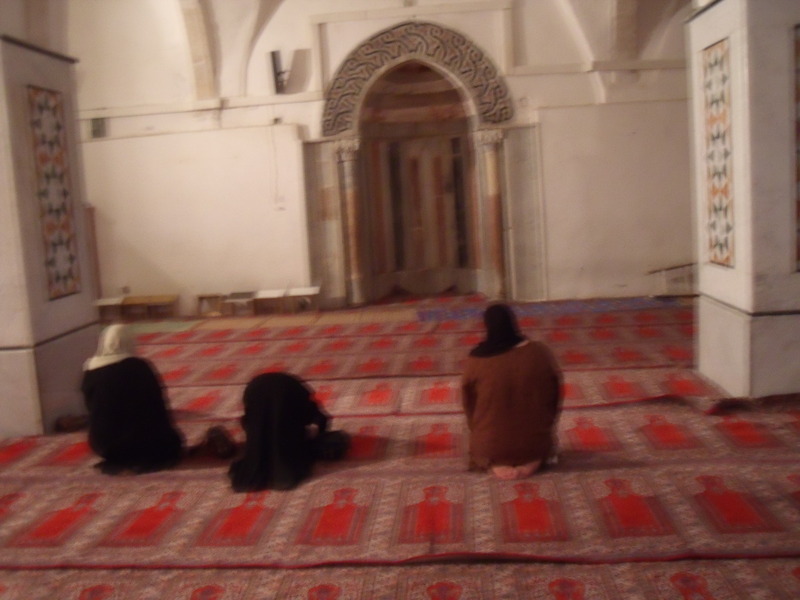 In the Machpelah, which is one half beautiful mosque and one half beautiful synagogue, are said to be buried the patriarchs and matriarchs of the Jewish people; Abraham, Isaac and Jacob as well as Sarah, Rebecca and Leah. Rachel is buried in nearby Bethlehem, where she is said to have died in childbirth. And Joseph’s tomb is said to be located in the West Bank town of Nablus. Hebron, Bethlehem and Nablus are all in the West Bank and are wanted by the Palestinians, along with east Jerusalem, as part of a future Palestinian state. The Synagogue of the Machpelah, Hebron. But Hebron, Bethlehem and Nablus are as much a part of the religion, culture and history of the Jewish people as the two Jewish Temples that used to sit atop the Temple Mount in east Jerusalem and which have since been replaced by the Golden Domed Mosque. The Western Wall is the only remaining remnant of the Second Jewish Temple. And it is partly with all this in mind that the Jewish people were granted the authority to return to these areas via the 1917 Balfour Declaration. But between 1949 and 1967 Jews were cleansed from these areas by the Arabs when Jordan controlled the West Bank. 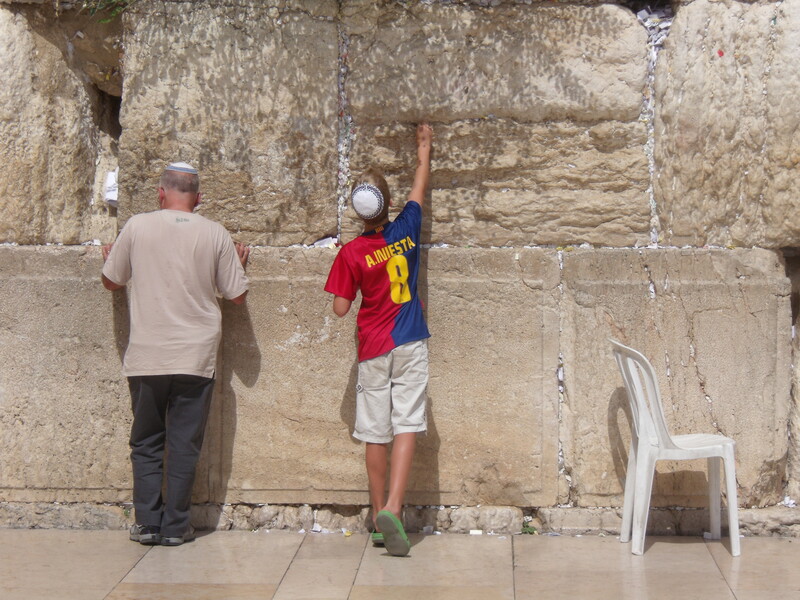 Israel took it during the 1967 war and since then Israeli Jews have been able to visit these sites for prayer or just cultural curiosity, if they wish. Most Jews, including non-Israeli ones, generally don’t though and the reason is clear. On Tuesday four Israeli civilians were gunned down in their car near Hebron. Hamas proudly claimed responsibility while Palestinians poured on to the streets of Gaza to celebrate the murder of innocents. The usual sickening excuses that the victims brought it upon themselves by being in the West Bank in the first place are being rolled out, but those who were murdered had every right to be where they were when they were killed. However many times an ignorant journalist or lazy presenter calls the settlements or the settlers “illegal”, that does not make it a fact. No where in international law are the settlements stated to be illegal. Anyway, it is not like Hamas thinks about international law when it wants to carry out a terrorist act. When they murdered those four people on tuesday they saw four Jews, not some dubious legal grievance. It was the same in Hebron in 1929, 19 years before Israel was born, when the Mufti of Jerusalem incited the slaughter of 60 members of the orthoodox Jewish community of Hebron. That said Jewish settlers should not necessarily stay in the West Bank just because they have the unambiguous right to. If there is a reasonable prospect of a proper accord with the Palestinians then the settlers can be removed in the cause of peace. This is all subject to negotiation now. The only people who can decide the course of events and history are those currently ensconced around the negotiating tables in Washington. However, it is highly incongruous that while the Palestinians are insistent on having all their religious needs met by holding on to Hebron and the Temple Mount in East Jerusalem (as stated, both being sacred ground for Jews also), the Jews are expected to lay waste to their own religious heritage. In a final peace agreement the Temple Mount in east Jerusalem, the holiest of Jewish sites, will be in Palestine as will Nablus and Bethlehem. 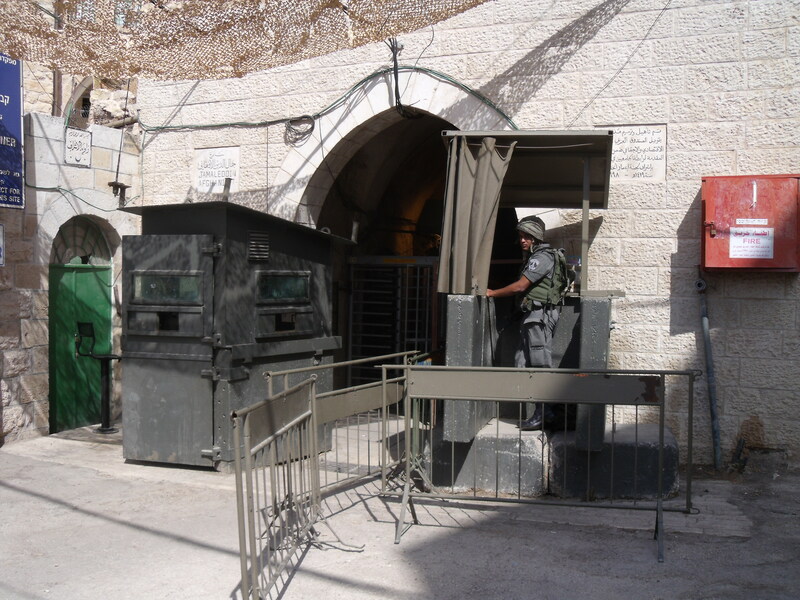 The Palestinians also expect to obtain Hebron, the second holiest of Jewish sites. While the Jewish people will still retain the Western Wall, where they can pray for dead and dying loved ones, it is only the Jews that will have sacrificed important parts of their religious heritage. If religious sites cannot somehow be shared then the Palestinians must also expect to give up parts of their own religious heritage for peace.